Robin’s new site was a visual rebranding project as well as an HTML to WordPress conversion. With a type-based logo created by a graphic designer, I created the modified DaVinci image header as well as the circle-triangle-square images that are the basis for Robin’s work. 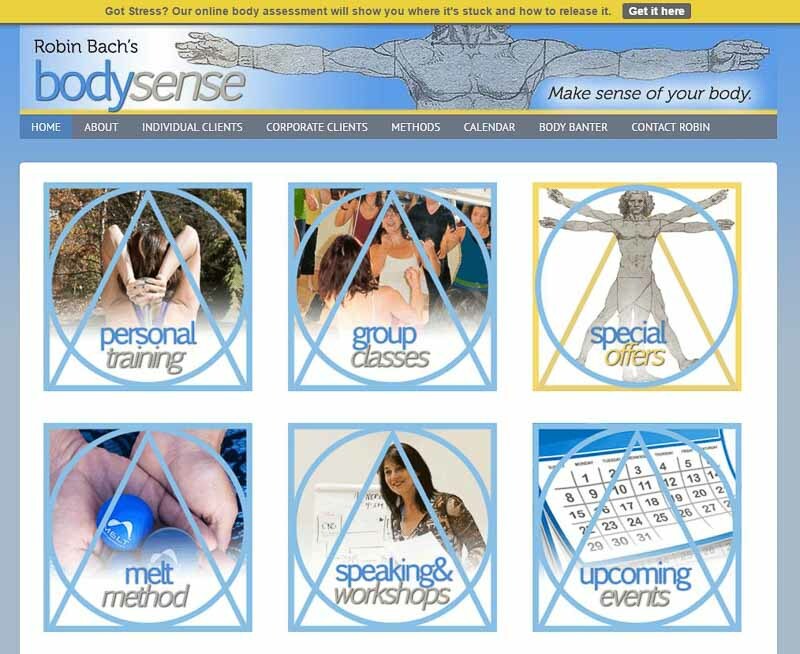 With the new site, Robin added new modalities and programs for new audiences. We added a Mailchimp mailing list with optins to her mailing list in several places, a blog for periodic articles, images and links for her product sales program and a Facebook business page. I provided the headshots, some product photos and most demonstration/event photos. We finished with training as well as a contract for ongoing hosting, monitoring and maintenance of the Body Sense website. All I knew about website development before meeting Liz, was that I needed one. As a self proclaimed technophobe, this task of marketing myself with a website and social media presence was a dreaded task. Liz was everything I needed: she knows it all, from how to manifest design and function from conversations about my needs, to linking all media presence together. Many of my clients and industry peers have commented on how gorgeous and functional my site is, especially the mobile version. If you need advise about upgrading your site, or building one, you just HAVE to see Liz.